Well, it's about time. Somebody finally took the notion to construct an online radio station that programs music that originated out of the Home of Rock & Roll, Memphis, TN. And listen to this, there ain't no cotton-picking commercials to interrupt your continuous groove. What a concept. Plus, it gets better. Not only is there great Rock & Roll being programmed on this station but listeners can quench their thirst for classic music such as Rhythm & Blues, Soul Music, Rockabilly, Jazz, Pop Hits, Modern Country and Blues from the Delta. Listeners will be remarked at the vast range of music coming out of The Bluff City. "We tossed around this idea one night while listening to our favorite music." shares music veteran Jon Scott from his home in Los Angeles. "We burned a few records onto disk and then downloaded them into our computer library and next we put 'em on the internet. Little did we know that folks from all over the world were listening." Scott and business partner David 'Flash' Fleischman then set out to sell banner ads on the web sites home page. "That's when our phone started ringing." said Scott after their first week of airing. "We're a project in motion and still tweaking the kinks out but the best is yet to come." 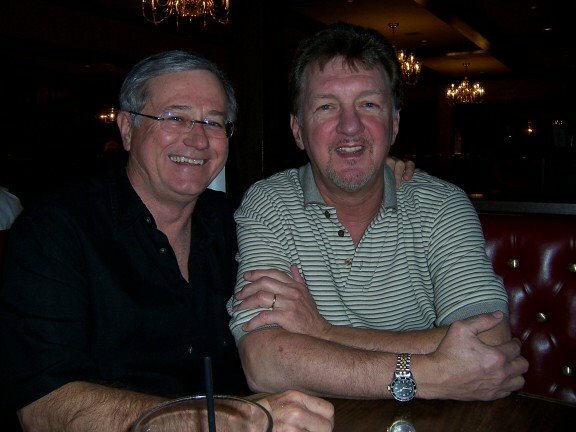 offered Scott who originated as a Memphis Disk Jockey back in the late 60's and early 1970's. 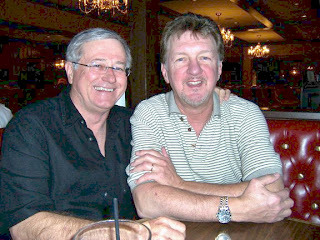 Pictured here is All Memphis Music co-founder Jon Scott with promoter Phillip Rauls who consults the online endeavor. Drawing from the rich musical community of Memphis, the on-air library features music produced from Sun Records, Stax Records, Hi Records, American Recording Studio, the Elvis catalog on RCA, The Sounds of Memphis Studio, Ardent Records and Studio, TMI Studio, Beautiful Sounds, Shoe Recording Studio, The Daily Planet, Lyn-Lou Studios, The Pepper-Tanner Studios, Oynx Recording Studio and Sonic Studios. If perhaps you're not familiar with those resources, fear-not because all references are Memphis institutions having participated in the development of the legendary Memphis Sound.